We love to order Meatball Parm subs and Eggplant Parm subs when we are just too tired to cook. But there is nothing worse than an undercooked eggplant, so disappointing. This is a wonderful dish that is simple and delicious, especially when you have a lot of eggplants in your garden like me! This is a very simple recipe with not a lot of steps. I used a jar Marinara, but homemade is always the best. I like Rao’s Marinara, it almost tastes like my homemade marinara. Hubs said this was the best eggplant Parmesan he has ever eaten. It’s great over angel hair pasta with a big tossed green salad. Place a layer of sliced Eggplant in a colander. Sprinkle with salt. Layer and salt all remaining slices. Let stand for 30 minutes. Beat the Eggs. Dip a slice of Eggplant into the Egg and then cover in Breadcrumbs. Heat Olive Oil in skillet. Fry Eggplant slices over Medium-High heat for two minutes or until golden. Place a layer of Fried Eggplant Slices in bottom of greased 8 x 8 or 9 x 9 square dish. Cover with a layer of Spaghetti Sauce. Top with Cheese. Repeat. Bake 20-25 minutes or until warm and bubbly. Reblogged this on Accidental Country Woman. Thank you for reblogging, hope your readers enjoy this recipe! Thank you Accidental Country Woman! Eggplant parm is my husband’s favorite food. I can’t wait to make this for him. Thank you for sharing! SO love eggplant parmesan! I order it out any time it’s on the menu, but I love making at home, too! G’day! 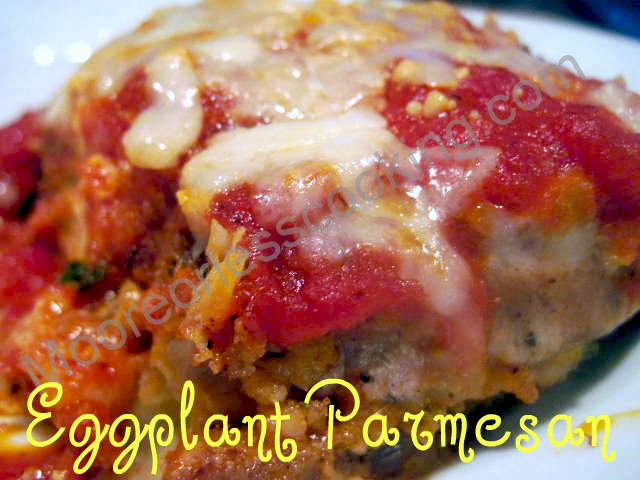 Eggplant Parm is one of my fave dishes! Your photo/recipe look yum!